Capture all your deep thoughts and brilliant ideas on these super cute Totoro notepads! Each page utilizes Studio Ghibli’s most famous character as a handy writing spot, with enough space to jot down anything that springs to mind. Gyarados’s thick scales makes him the ideal Pokemon accessory to wear on chilly days! Approximately 4 feet long, this one size fits all scarf is hand crocheted and available in either shiny red or his normal blue color. While not everyone can possess the power of Sharingan, at least one can dream of it with this sleeping mask! Makes as an obvious warning sign to attackers that your sleep is precious to you and comes available in many different styles. These may look like real Pokeballs, but don’t let them fool you! Instead of a Pokemon hiding inside, these accurately designed Pokeballs are filled with soft stuffing, making them the perfect toy for throwing around! Cook a meal fit for Tuxedo Mask without ever getting your Sailor Scouts uniform dirty. This one-size-fits-all apron lets you live out your childhood dream of harnessing the power of the moon to the fight evil forces that is bad cooking. Make taking naps even more exciting by cuddling up under the covers with your friendly neighbor Totoro! This incredible throw blanket is super soft and super cuddly, featuring a fluffy design of Totoro’s face and belly. Transform yourself into Madara, the cute and round cat from the series Natsume Yuujinchou! Each kigurumi is made by hand from high quality fleece and suited to your measurements for a comfy and snug fit. Unfortunately, unlike the real Korosensei, this plate doesn’t change its color! Make use of homeroom teacher’s large, bulbous head as the ideal dinner plate for Assassination Classroom fans. Have his cheeky grin and beady eyes join your meals! A superb cosplay messenger bag that features one of the most recognizable characters from Kiki’s Delivery Service, Jiji! As you tote around your gear, Kiki’s pet cat will poke his head out of the bag as he minds your stuff. Add a touch of cuteness to everyday notes and memos with a bunch of little Soot Sprites! Enjoy spreading a plague of these black and fuzzy creatures around the office and school property with this Studio Ghibli inspired rubber stamp! Oh. You watch Naruto too? Send nudes… This hilarious t-shirt is the perfect way to wear a subtle, sexual message. Not to mention it’s a killer conversation starter and guarantee to get some giggles from Naruto fans! The Titans have breached the walls, pack your bag and run! Show off your Survery Corps pride while being able to store all your gear in a spacious and hollow bag. This Attack on Titan Backpack is perfect for school or outdoor activities. There’s no one in this world that loves ham more than Ponyo. No one! Celebrate the love of her favorite food with this Studio Ghibli inspired t-shirt featuring Ponyo stealing some ham from a giant bowl of ramen noodles. 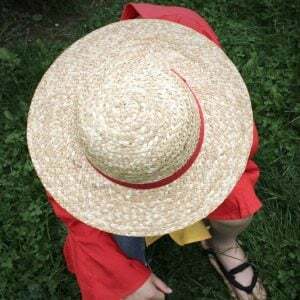 Protect your head from the sun and look cool with this accurate design based on Monkey D Luffy’s signature hat. Makes a great gift for anyone who’s a fan of One Piece, or dreams of one day becoming the next Pirate King! Be the envy of every Spirited Away fan by living out the fantasy of riding Haku in his dragon form! This gigantic 10 foot long plush has been given a combination of several fabrics to give him a lifelike texture and color. Nothing works better to prevent getting drenched quite like moon power! Designed after Sailor Moon’s Spiral Heart Moon Rod, this is the most unique umbrella you will ever own! Moonies will be wishing it rains everyday! Let the eyes of exterminated Uchina clan members dangle in your stretched out ear lobes! These flared tunnel plugs are available in variety of Sharingan eyes, from Sasuke to Rinnegan! Order them in silver steel, gold-played, or black titanium. Sleeping by moonlight, taking naps by daylight! This double-sided throw pillow is perfect for any Magical Girl out there in need of their own guardian cat! A great addition and gift idea for any Sailor Moon fan’s home. Ensure you’re never alone by having Totoro accompany you on all your adventures! This elegant sterling silver ring features carved details that perfectly represents the furry forest creature clinging to your finger.